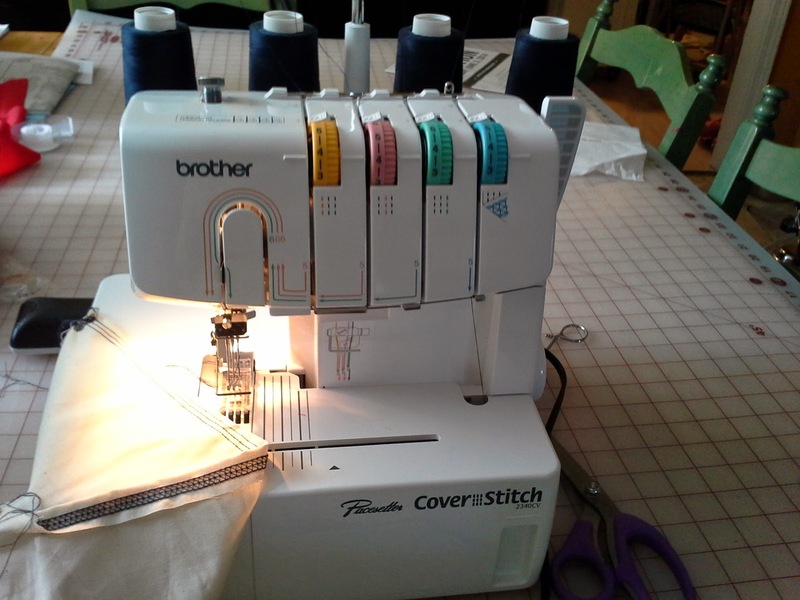 Mrs. Toad Sews: New Brother 2340cv Cover Stitch! Just when I had convinced myself that I can wait to get a cover stitch machine I had an interesting conversation with Mr. Toad. Last week Mr. Toad had taken a day off and asked me if "those underwear (the Comox Trunks) would be easier to make with that machine you want." I wasn't sure how to answer. I just replied, "Maybe. I don't because I haven't tried using one yet." He polite responded, "Let's get it for you for Mother's Day, and get those attachments so you won't need anything later." So, I promptly ordered it. 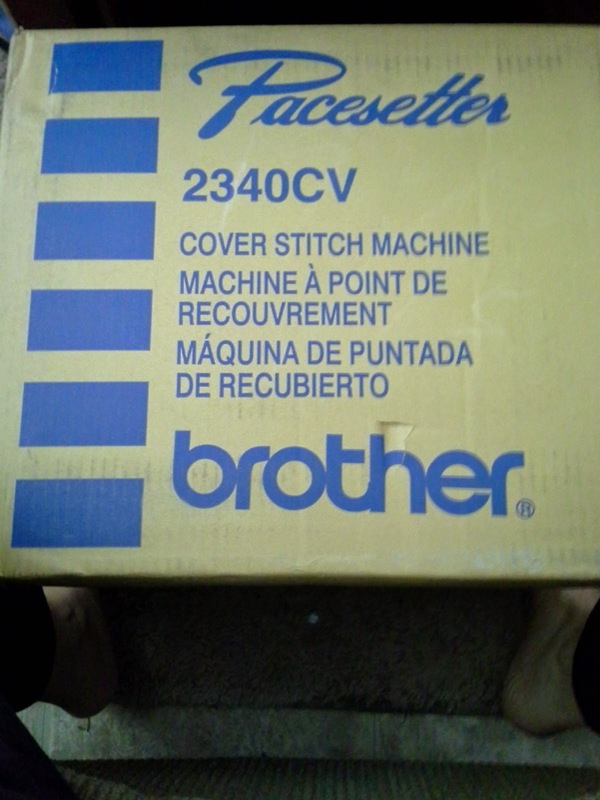 It is the Brother 2340CV Cover Stitch that I have been dreaming of having. 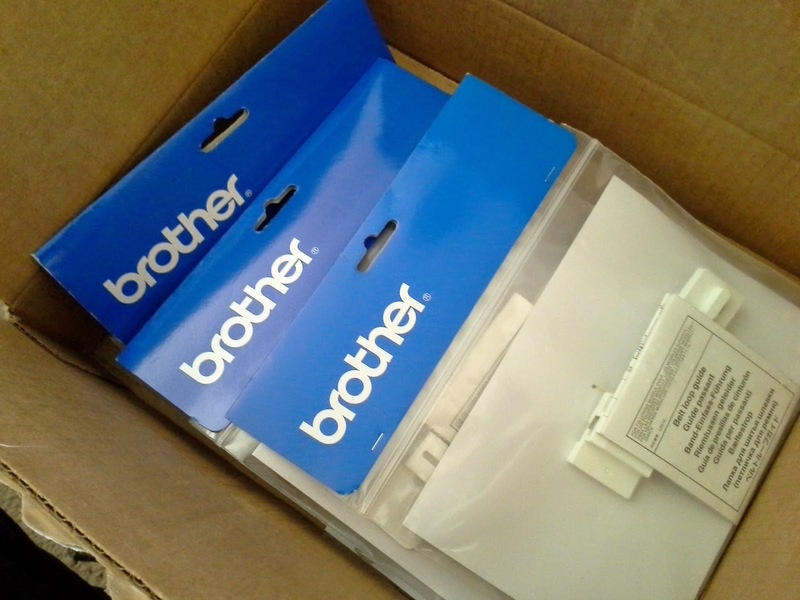 Even though AllBrands had a much better package deal, I ended up ordering from Amazon because it would be here sooner. I've now had it for six days, but haven't had sufficient time to play with it or master it. But, I am looking forward to just sitting down and getting to know it. Mr. Toad isn't worried that I haven't been using it--I bought him a new cabinet table saw for Valentine's Day that has yet to cut a piece of wood. I will tell you that it was easy to thread. Like the Brother 1034D , it is labeled and numbered along the threading path. It can use one, two, or three needles. It has one stitch in one direction, but you can adjust the length. The width of the needles is determined by which needles you use. One thing that I am disappointed with is that there isn't much in the way of instruction the way most machines will give. Luckily, there is the internet and tons of wonderful bloggers who share their experiences. 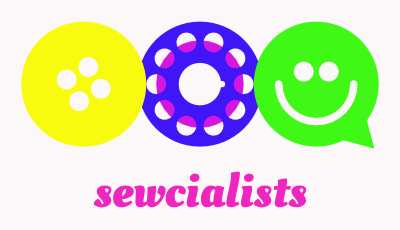 I will report on my sewing projects that I am finishing, having trouble with and am planning in the next few days. With the end of the school year approaching, my time is being pulled away from sewing and computer time. We've also had some family drama. I have been sewing, but haven't had much computer time. Lucky duck! Do tell how it works. .. I tried it today! It works great. I just need to figure out the attachments have the time savings. Jealous! :)So excited for you!!! Now you get to figure it all out for the rest of us! I will definitely try to figure it out when I'm not so busy. The pressing the pedal and making it go forward is easy. Using the attachments to make it faster and easier is not working well for me yet. I didn't want to make anyone jealous. Mr. Toad just spoils me. Having been a woodworker, he understand the need for the right tools and the extras that make the gadgets work best. Congrats!! 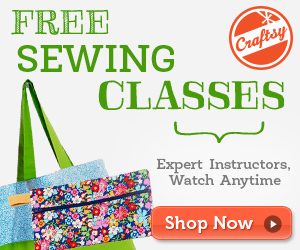 Ken's Sewing Center has great YouTube videos about the attachments. I've tried to decipher the directions and had no luck so far (I haven't tried that hard, though). Thanks Beth. The only video that I learned from was the binding one. Other than that, I have been sitting with a bunch of ugly and left-over fabrics. I have managed to figure out threading, starting and ending stitching--and removing the fabric, and hemming--single and double. I'm trying to figure out how to show others in a way that actually is usable. There isn't much help for this machine or the attachments. Have you been testing with wovens? I think that's what I need to do. Knits move around and I can't figure out what I'm supposed to be doing. Hi, Beth. I did try with knits first, before I tried the attachments. 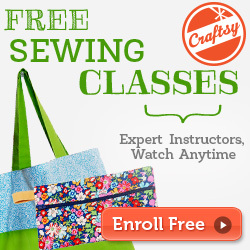 I was just using some scraps I had on my sewing table. Then I found some larger scraps. I used a dark color with muslin and red wovens that were also scraps. Those are what Ibhave been successeful with. I used a tutorial from SewMaris.com/blog on using a coverstich for hemming. I ended up basting my hems and not using the attachments. It took quite a while. I'm thinking that I may do a video to show how I'm getting things to work. I have threading and removing and pulling threads to the back mastered. I feel pretty confident with the single fold hem on wovens and want to practice on knits. Double folds no longer intimidate me and I'm soon to master the binder. I just haven't had real reasons to use them and the motivation hasn't been there. Hopefully, I can try to get a decent angle to record video without shaking. Then figure out how to post.